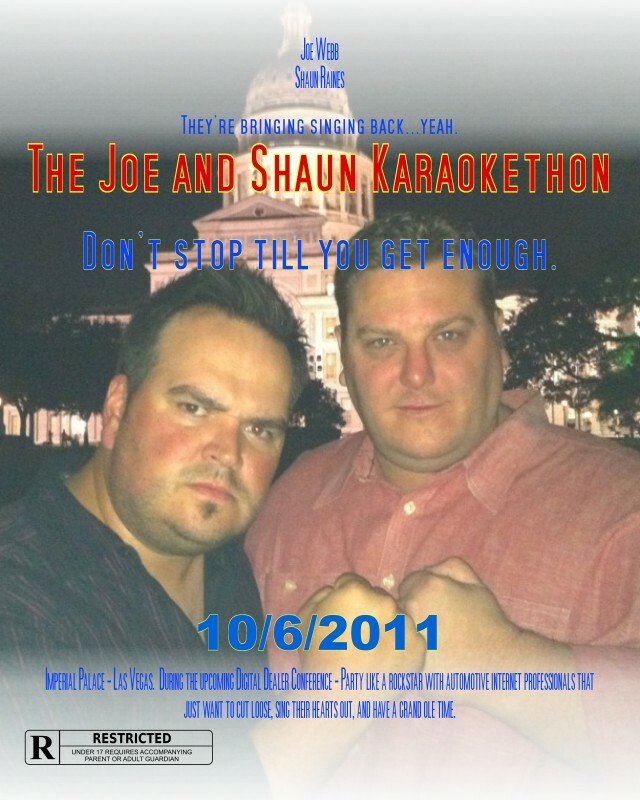 The Joe and Shaun Karaokethon is back! Last year’s JASKT was a ton of fun and Joe Webb and Shaun Raines invite you to their next little shindig. Imperial Palace – Karaoke Club on 2nd floor. Las Vegas, Nevada – Oct. 6th. 10pm – 2am (or longer) on the 2nd night of the 11th Digital Dealer Conference. This will be the 7th time Joe Webb has held a karaoke party during a Digital Dealer Event and over the last few he has teamed up with Shaun Raines to add even more to the awesomeness. These aren’t large, sponsored affairs…(not unless someone WANTS to sponsor it :). If you want to just kick back, do a little singing, and have fun meeting your automotive Internet peers, this is the place for you. Joe Webb + Shaun Raines + friends + karaoke = Awesome Sauce. This entry was posted in Promos for the Joe and Shaun Karaokethons and tagged dd11, digital dealer, jastk, joe and shaun karaokethon, joe webb, karaoke, karaokethon, shaun raines. Bookmark the permalink. This entry was posted in Karaoke Videos from the Conferences and tagged digital dealer, groupie, karaoke, reach local, shaun raines. Bookmark the permalink. Shaun Raines of ReachLocal breaking out on stage during Joe Webb’s Karaoke night at Digital Dealer 6. This entry was posted in Karaoke Videos from the Conferences and tagged digital dealer, joe webb, karaoke, reach local, shaun raines. Bookmark the permalink. Here I am performing Bust A Move (by the brilliant Young MC) in Las Vegas during DD6. This entry was posted in Karaoke Videos from the Conferences and tagged bust a move, dd6, digital dealer, joe webb, karaoke, young mc. Bookmark the permalink.